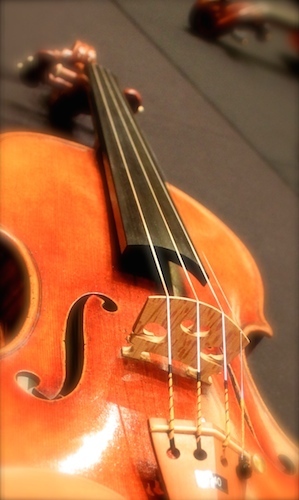 Of all the Alexander lessons I took related to violin playing, I think the most meaningful for me was one in which the teacher (not a violinist) stopped me at the exact moment before I was about to pluck the violin out of its open case. "Think about how you would walk across the room to get a pencil. Compare that with the excitement you are feeling now and observe how it is affecting you, even though you are essentially doing the same physical act. In life we have 'choice points,' where we can stop and observe what we are doing and consciously use ourselves better. So instead of leaning over in that habitual way and grabbing the instrument willy-nilly, stop and feel the ease in your neck, as your head goes forward and up and you back widens etc…." Is my bow hold ok? Is my right thumb tense? How about my left thumb? I am not giving a complete list here but there isn’t actually that much to observe. Then take some time to reset yourself; visualize yourself completely relaxed; take mental stock of what you are actually trying to achieve and whether a change of course might be more useful, and so on. If necessary, set a timer to go off every five or ten minutes until one gets into the habit of doing this. Hopefully, this way of thinking about how we use ourselves during practice will lead to greater productivity and less damage in the long run. After all, I still want to be serenading my sweetheart and annoying my cat at 90. Alexander Technique is a daily exercise routine? Great blog post Buri, I really like that idea of choice points. Make the choice when we have the time to make the choice. When trying to change a habit I would get students to "stop and go." Play 4 notes, stop, think what you just did, think what you're going to do, play next 4 notes, stop, think, etc. Play a measure, stop and think, play next measure, etc. Focus on one thing at a time, learn how to bracket everything else. I think I drove them crazy, but the way you frame it is much more zen. When I get into something I often have a hard time stopping to break and reflect. I think I need to choose to stop and make more choices. Definitely a new part of my daily technical regime -- so much forcing of bad motions goes on during that time. Buri, how can you be so confident about what you hope to be doing when you're 90, when even now you're doing it the other way round from what you said? Great post, Buri. Why do these etudes need to be as long as K9? Sometimes I wonder if the composers of these things just padded them out to two pages. On the other hand, why are there no three page Kreutzers? Paul, good point. I recall some teachers at college just asking students to work on a line or two of an étude simply because there was no time to get through all the études it was felt were necessary. The other reason is to develop two fundamental aspects of our arsenal: memory and stamina. Vadim Bron once said that because he was forced to learn the kreutzer from memory , memorization became easy for him. Musically, they're okay. I think that point makes the most sense for the younger student. But I agree wholeheartedly with the stamina point. I just don't have it yet. My teacher told me to stop every 5 minutes and loosen up my right thumb--actually redo my bow hand. I take that as an opportunity to check the tension everywhere in my body. As for going for my violin--I always do it consciously because once I accidently dropped my bow on my violin as I was putting it in my case. I don't want to ever make a similar mistake again.